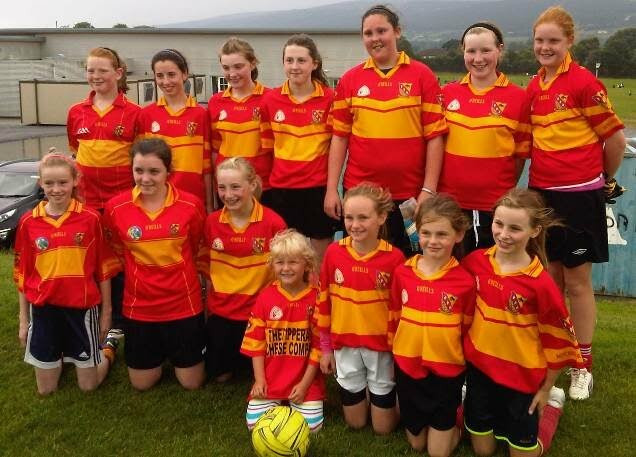 After a marathon session of football, a young Moycarkey-Borris Ladies Football team captured the Shield Final at an Under 14 Blitz run by the Cahir Ladies Gaelic Football Club on Saturday August 11th. Due to a variety of reasons, Moycarkey were short a number of players and travelled with a young panel of 13 players. Paired in a group with Cork clubs Douglas and Mitchelstown as well as Aherlow, Moycarkey played well at times and earned themselves a spot in a three-way playoff with St. Patricks and Killenaule. Moycarkey’s first playoff game against St. Patricks was a closely fought affair. St. Patricks played with wind advantage in the first half and a well worked goal on the stroke of half-time gave the South Tipperary side a three point interval lead. Moycarkey dominated the second half and St. Patricks had to rely on some excellent defending and an inspired goalkeeping performance to hold out for victory. Subsequently, St. Patricks defeated Killenaule, a result which earned them a place in the final, setting up a game between Killenaule and Moycarkey-Borris to determine the second finalist place. After a tight first half, Moycarkey played some good football in the second half to earn a victory and a rematch with St. Patricks in the Final. And so the scene was set for the final, the 6th match for two tired teams. St. Patricks won the toss and elected to play with the strong breeze. This tactic meant that the Moycarkey rearguard were under severe pressure in the first half. However, a combination of good defending by Moycarkey allied with some poor shooting by St. Patricks ensured that neither side raised a flag in the first half. It was now time for Moycarkey to cash in with the wind assistance. And this they did, scoring two quick points to take the lead. St. Patrick’s were not going to lose without a fight and piled on the pressure in the last couple of minutes. Under extreme pressure, the Moycarkey team were determined they would not concede a score and when an injury time 45 metre free in was cleared, the final whistle went and Moycarkey had secured victory. 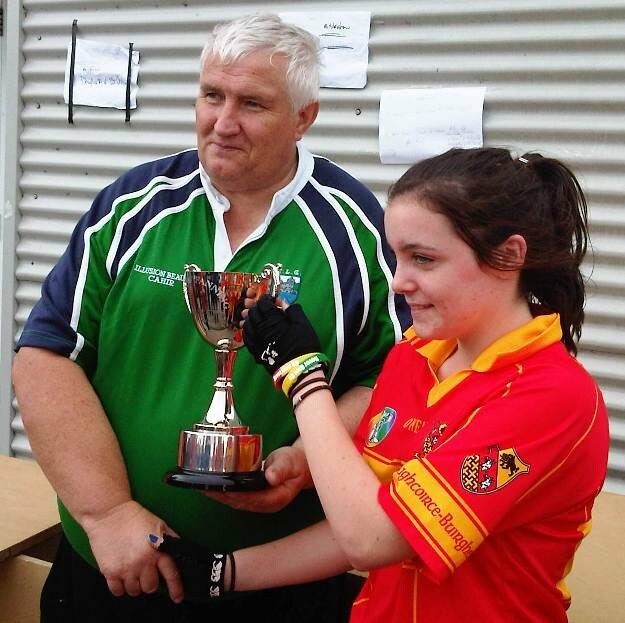 Afterwards, Liam Shinnick representing the Cahir Ladies Gaelic Football Club congratulated both teams on an excellent display of football before presenting the trophy (sponsored by Andy Fanning) to the Moycarkey-Borris captain Emily Walsh. All of the Moycarkey players then received their medals before retiring back to McDonalds for a well-deserved meal. Moycarkey’s ultimate success on the day was down to perseverance, determination and a pride in the red and yellow jersey which shone out in each of the 13 players on show. 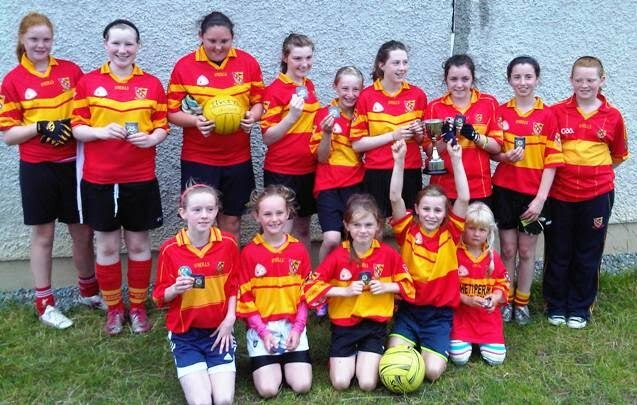 Unlike all other clubs taking part, Moycarkey had the bare 13 players, 7 of which are still Under 12 this year. As a result, the opportunity to give players a rest during the marathon session of 6 matches was not possible. While there were plenty of knocks and muscle strains by the time of the final, the players shrugged off all these ailments to give every ounce of energy they had to secure victory. While the team was led ably by the 7 regular member of the team who played in the County Final a few weeks ago, the performance of our younger players on view was most encouraging as they grew in confidence with each match. Without these Under 12 players, this success would not have been possible and it augurs well for the future. Thanks to the mentors on the day including Ann Slattery, John Woodlock, Billy Cummins and Ollie Walsh. Thanks also to all the parents who helped out on the day.